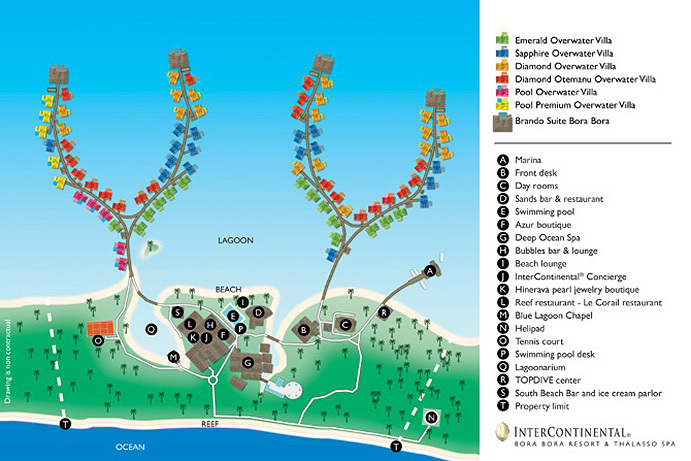 The Emerald Overwater Villas are located close to the resort common areas, with a view to the beach and the motu. Modern and luxurious, these spacious units, feature sleek, contemporary décor with traditional Polynesian design touches. Each villa has a spacious living room with a glass coffee table that looks down onto the pristine waters and tropical fish below. The plush king-size bed (or twin beds on request) faces a large picture window that overlooks the lagoon. The bathroom features a separate shower and a bathtub also with view to the turquoise blue waters. The split level terrace offers comfort and privacy, with a shaded area and a sundeck with direct sunlight and lagoon access. 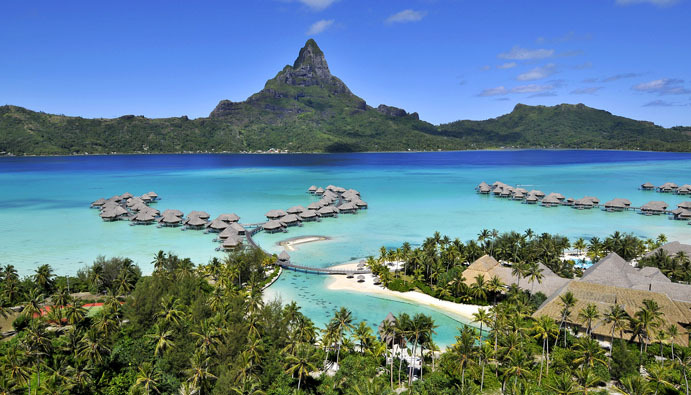 The Sapphire Villas feature one of the most remarkable views over the clear blue waters of the lagoon and Bora Bora island. Situated between the Emerald and Diamond Villas, they have a roomy area of 100 sq meter, including the split-level terrace and the sundeck from which you can step into the warm lagoon. Each room will accommodate up to 4 adults or 3 adults and 2 children in 1 king bed or 2 single beds plus 2 sofa beds. 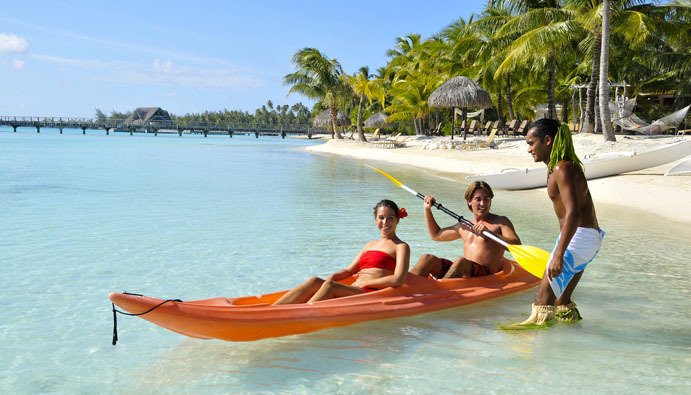 The Diamond Villas are located in absolute peace and are the furthest out from the resort in the turquoise waters of the lagoon. They have a roomy area of 100 sq meter, including the split-level terrace and the sundeck from which you can step into the warm lagoon. Each Junior Suite will accommodate up to 4 adults or 3 adults and 2 children with 1 king bed or 2 single beds plus 2 sofa beds. 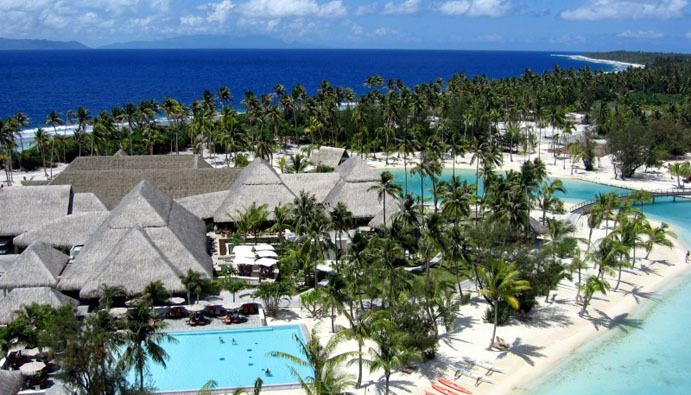 The Diamond Otemanu Villas are located in absolute peace, with incredible views facing Mount Otemanu. 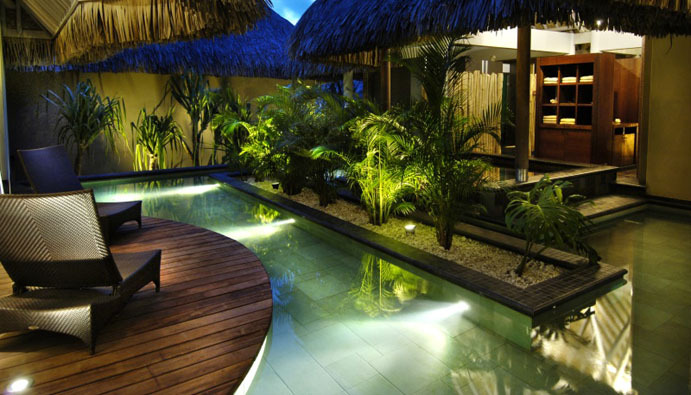 They are spacious and include the split-level terrace and the sundeck from which you can step into the warm lagoon. Each Junior Suite will hold up to 4 adults or 3 adults and 2 children in 1 king bed or 2 single beds plus 2 sofa beds. 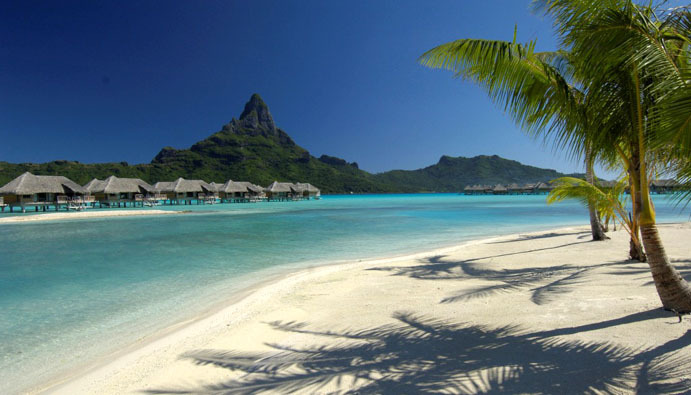 The Overwater Villas with pool offer views of the beach and feature a private outdoor pool. 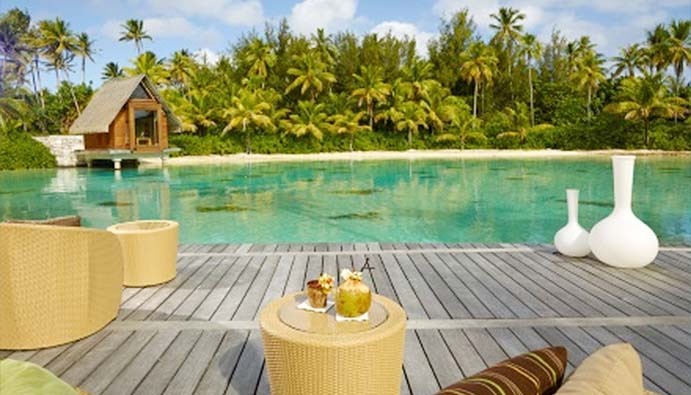 Adjacent to the pool, a spacious shaded terrace and sundeck with sun loungers, and a direct access into the lagoon. Modern and luxurious, these spacious units, 125m², feature sleek, contemporary décor with traditional Polynesian design touches. Each villa has a spacious living room with a glass coffee table that looks down onto the pristine waters and tropical fish below. The bedroom, with a plush king-size bed (or twin beds on request) overlooks the private outdoor pool. The bathroom features a separate shower and bathtub. 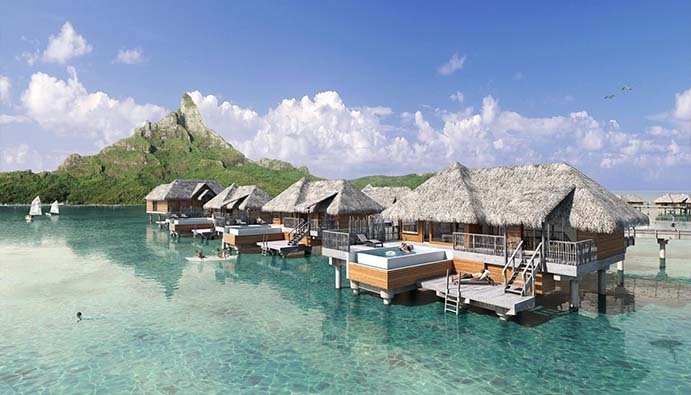 The Premium Overwater Villas with pool are the exact same layout as the Overwater Villas with pool however offer a magnificent horizon infinity view where you can sit in your private outdoor pool and enjoy the views. The Prestige 1 Bedroom Overwater Brando Suite with pool provides stunning views of Mt. Otemanu and is perfect for those seeking privacy. The suite is modern and luxurious and features sleek, contemporary décor with traditional Polynesian design touches. Its cathedral ceilings are magnificent and unique for overwater suites in French Polynesia. The total soundproofing is exceptional when windows and doors are closed, thanks to the use of the latest innovations in the field of building. The bedroom faces a large picture window and overlooks the lagoon and the island. It has an en-suite bathroom with a separate shower and a double bathtub, a double washbasin, and a complimentary range of luxury amenities. The bathtub faces a picture window for enjoying views while soaking in the tub. The suite features an expansive living room, open to the terrace. The private outdoor infinity pool is adjacent to the spacious shaded terrace and the sundeck, with sun loungers for sun bathing and a direct access into the lagoon. A freshwater shower is also located on the sundeck. Maximum Occupancy: 3A or 2A+2C . Bed Configuration:1 king bed or 2 single beds + 1 sofa bed (pullout) . The Prestige 2Bedroom Overwater Brando Suite with pool provides stunning views of Mt. Otemanu and is perfect for those seeking privacy. The suite is modern and luxurious and features sleek, contemporary décor with traditional Polynesian design touches. Its cathedral ceilings are magnificent and unique for overwater suites in French Polynesia. The total soundproofing is exceptional when windows and doors are closed, thanks to the use of the latest innovations in the field of building. Two master bedrooms face a large picture window and overlook the lagoon and the island. Each bathtub faces a picture window for enjoying views while soaking in the tub. Each suite has also an expansive living room, a nice dining table; and upstairs, an office and a relaxation lounge. The private, outdoor infinity pool is adjacent to the spacious shaded terrace and the sundeck, with sun loungers for sun bathing and direct access into the lagoon. 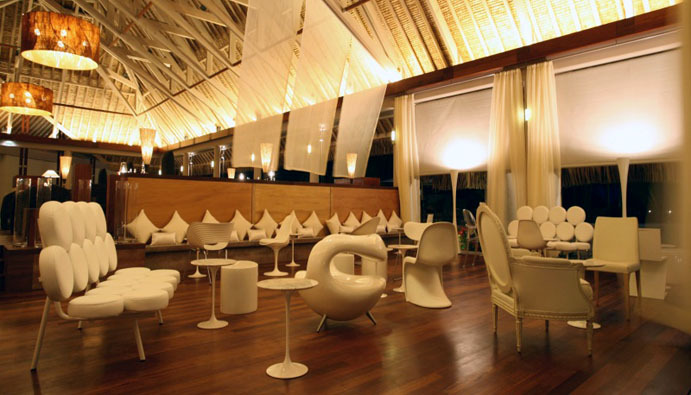 Casual, Lounge music, colorful and fresh decoration. Pool service. 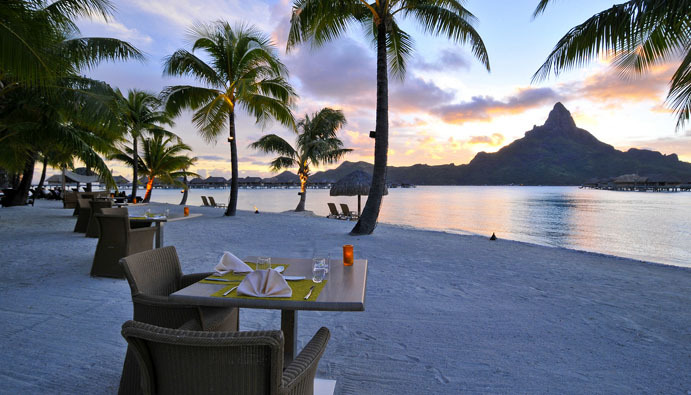 Exceptional wine cellar: the largest in French Polynesia….. 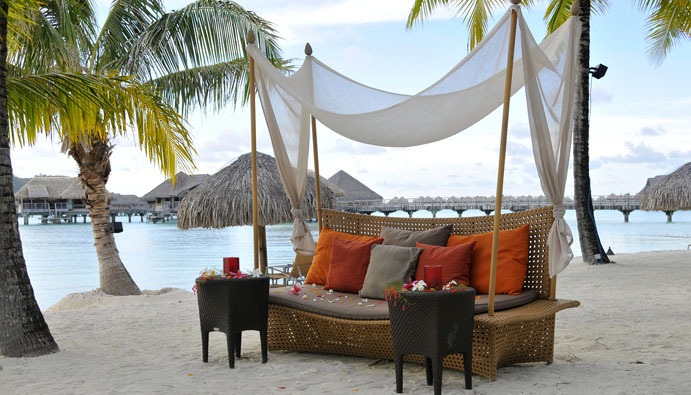 Weddings – Polynesian tradtional ceremony on a private beach or in the overwater chapel with a large glass floor above a coral nursery, home to a multitude of colorful fish. 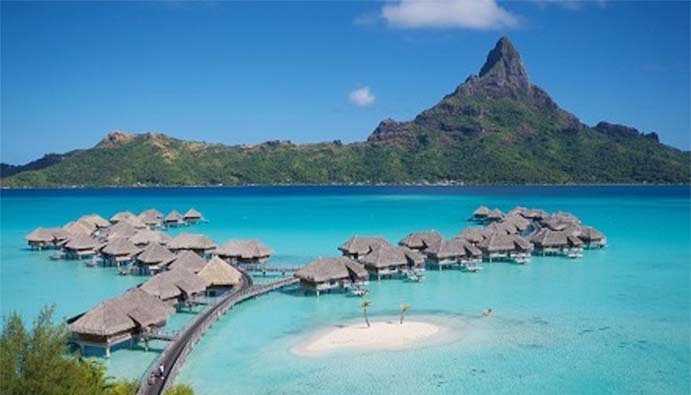 The InterContinental Bora Bora Resort & Thalasso Spa is located on a virgin beach on the “Motu Piti Aau” along the eastern side of Bora Bora and is accessible only by boat. 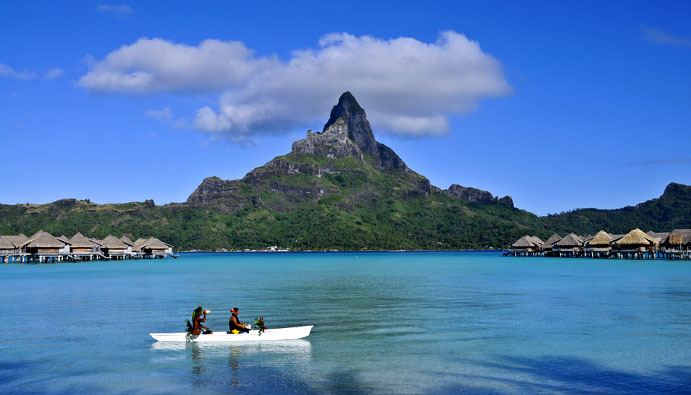 The view of the main Island from the Resort is unique, especially of Mount Otemanu, rising majestically across the blue crystal waters of the lagoon. 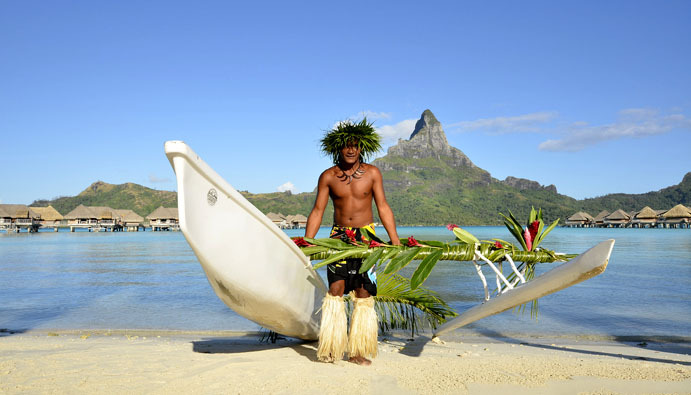 Access to the main island is easy with a free boat transfer to the InterContinental Bora Bora Le Moana Resort, ideally located on Matira Beach on the main island. The resort features an eco-friendly air-conditioning system by using the cold of deep-sea water extracted from the Pacific Ocean and its spa is the very first Thalasso spa in the world to utilize the benefits of the deep-sea water and minerals in all of its signature treatments. 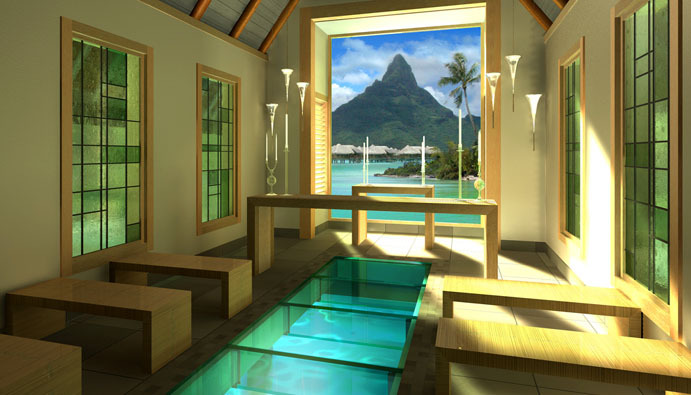 Spa lovers enjoy one of the best spas on the island while everyone marvels at the views looking towards Bora Bora.